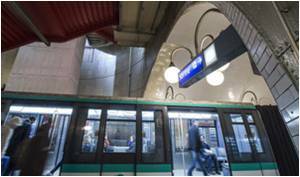 STIF, the Paris transport organising authority, approved on 10 July the proposal of RAPT to convert Line 4 into a fully automated metro line. This project is to increase the capacity, regularity, quality of service, responsiveness and safety of the line. Line 4 is now the Paris metro’s second busiest line, averaging 740,000 passengers a day. Over 100 years old, the rubber-tyred line has 12.1 km and 27 stations. With conversion, the line will feature 21 driverless trains Alstom MP89, currently in service in the automated Line 14 (Meteor). Line 4 will also receive Alstom MP05 trains bought for Line 14’s extension to the north, which is programmed in 2018, as Line 14 fleet changes progressively from 6-car trains to 8-car trains a few months after it’s extension. The conversion to full automation of line 4 should be completed by 2022 with no major traffic disruption. The early work (modernization of tracks, signalling, OCC…) is planned for 2014.